LOL. dude is grammy winner, wow. DALLAS — Randy Travis was charged with driving while intoxicated and threatening law officers after the country singer crashed his car and was found naked and combative at the scene, officials said. A mug shot released by the Grayson County Sheriff's Office shows a battered-looking Travis in a grey T-shirt, with a black eye and dried blood on his face. He later walked out of the county jail wearing scrubs, a University of Texas ball cap and no shoes. It was the second Texas arrest this year for Travis, who was cited in February for public intoxication. The sheriff's office in Grayson County, located in far North Texas along the border with Oklahoma, received a 911 call at 11:18 p.m. Tuesday about a man seen lying in a road west of Tioga, where the entertainer lives. Texas Department of Public Safety troopers responding to the scene said a Pontiac Trans Am registered to Travis, 53, had been driven off the road and struck several barricades in a construction road. Travis was not wearing clothes at the time of his arrest and made threats against the Texas troopers, said Tom Vinger, a DPS spokesman. He said the singer refused sobriety tests, so a blood specimen was taken. 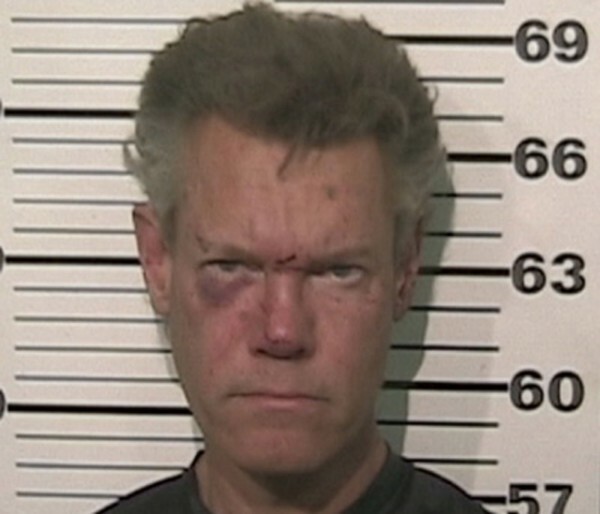 Grammy-winning country star Randy Travis has been cited for assault in a fight outside a church in a Dallas suburb after the singer stepped into an argument between an estranged husband and wife, police said on Friday. The incident happened on Thursday night in the parking lot of Prestonwood Baptist Church in Plano, Texas, said the city's police spokesman, who downplayed reports that the singer was drunk at the time. "Witnesses are reporting and our investigation revealed that Travis assaulted the husband," said Officer David Tilley, adding that Travis was a friend of the woman.